An original letter of correspondence between brothers and business partners Joshua Coffin Chase and Sydney Octavius Chase. Topics discussed in the letter include matters with the Lancaster-Rankley family and Joshua's recommendation to hire Carl Haas to manage property at Isleworth Grove should A. Q. Lancaster resign. 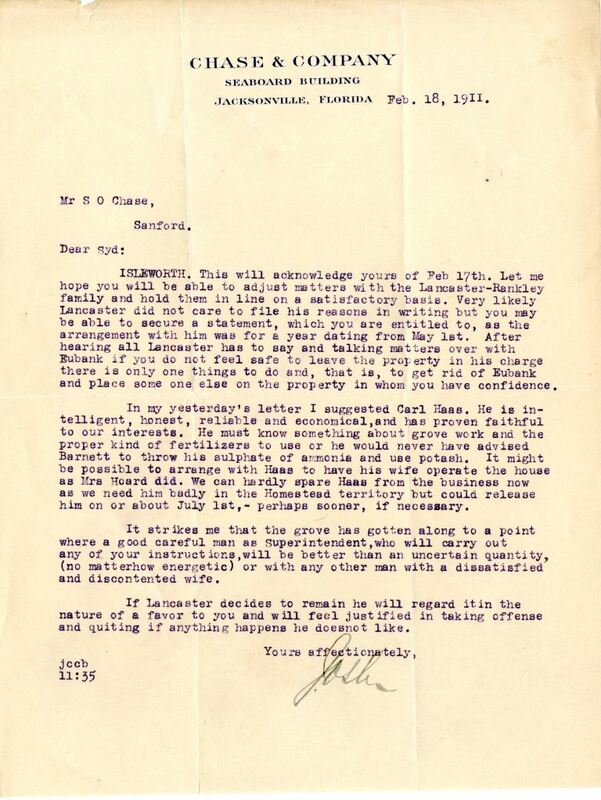 Original letter from Joshua Coffin Chase to Sydney Octavius Chase, February 18, 1911: box 49, folder 20.84, Chase Collection (MS 14), Special and Area Studies Collections, George A. Smathers Libraries, University of Florida, Gainesville, Florida. Digital reproduction of original letter from Joshua Coffin Chase to Sydney Octavius Chase, February 18, 1911. ISLEWORTH. This will acknowledge yours of Feb 17th. Let me hope you will be able to adjust matters with the Lancaster-Rankley family and hold them in line on a satisfactory basis. Very likely Lancaster did not care to file his reasons in writing but you may be able to secure a statement, which you are entitled to, as the arrangement within him was for a year dating from May 1st. After hearing all Lancaster has to say and talking matters over with Eubank if you do not feel safe to leave the property in his charge there is only one things to do and, that is, to get rid of Eubank and place some one else on the property in whom you have confidence. In my yesterday's letter I suggested Carl Haas. He is intelligent, honest, reliable and economical, and has proven faithful to our interests. He must know something about grove work and the proper kind of fertilizers to use or he would never have advised Barnett to throw his sulphate of ammonia and use potash. It might be possible to arrange with Haas to have his wife operate the house as Mrs hoard did. We can hardly spare Haas from the business now as we need him badly in the Homestead territory but could release him on or about July 1st, - perhaps sooner, if necessary. It strikes me that the grove has gotten along to a point where a good careful man as Superintendent, who will carry out any of your instructions, will be better than an uncertain quantity, (no matterhow energetic) or with any other man with a dissatisfied and discontented wife. If Lancaster decides to remain he will regard it in the nature of a favor to you and will feel justified in taking offense and quitting if anything happens he doesnot like. Chase, Joshua Coffin. 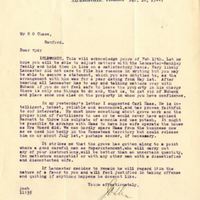 “Letter from Joshua Coffin Chase to Sydney Octavius Chase (February 18, 1911).” RICHES of Central Florida accessed April 21, 2019, https://richesmi.cah.ucf.edu/omeka/items/show/2713.